Seven hand-made guitars commemorating the loss of life and buildings in the Christchurch earthquakes will be sold at a live auction and cocktail evening in Christchurch on Friday. The event at the Armstrong Prestige Mercedes-Benz showroom will feature performances by Stars in their Eyes winner and Christchurch singer Mandy Pickering. 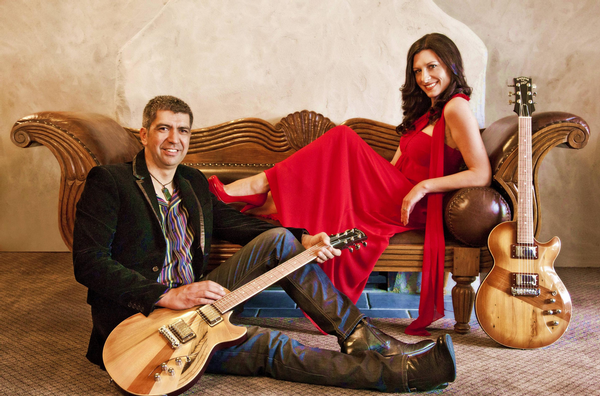 Accompanied by her guitarist husband Jason, she will perform two songs on each of the Heart Strings guitars. They will start with their version of ‘When the War is over’ and then also perform a number of covers including ‘While My Guitar Gently Weeps’ and ‘Angel’ and some of my her original songs that will feature on her upcoming album. The Heart Strings guitars were crafted by Pickering’s father-in-law, Bruce Pickering and were created using timber from important historical buildings that fell in the Christchurch earthquakes. On-line Trade Me bidding for the unique guitars will be combined into a live auction for Christchurch people at Friday’s event. All the profits will go to the Christchurch arts community. This will be the last time the Heart Strings family of guitars will be seen together as it is expected that each of the guitars will be sold and go to a different homes all over New Zealand. An eighth guitar, named Kia Kaha, was built out of timber from the historical Lyttelton Time Ball building. A scroll holding the names of those who lost their lives has been gently laid to rest inside the guitar, donated by her husband Jason and Pickering’s father-in-law. The guitar has been featured at an exhibition in the Canterbury Museum.